The author describes this as a dozy mystery, rather than a cozy mystery, which right from the start gives you the idea that the book is likely to be quirky and fun. And it is. It’s a very enjoyable, well written and easy read. Ron, our laid back hero, who only panics now and then such as when it looks like he’s been snugly stitched up as the perpetrator of the crime, leads us through the story. 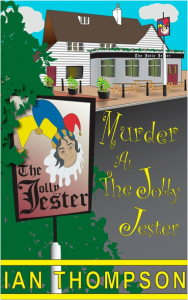 He’s determined to find out who did actually sink a machete into Old Pete’s head, and so he sets about the task, very unably assisted by Sam, his colleague at The Jolly Jester. He encounters various other shady but fascinating characters along the winding way. He discovers, as do we, that there’s a lot more going on in the village of Duckley than meets the eye. Well worth a read, and many thanks to the author for keeping me thoroughly entertained. Available from all the Amazons. Posted in Book reviews, Ebooks, Fiction, Kindle.Tagged book review, cozy mystery, dozy mystery, Ian Thompsn, Jolly Jester, murder.